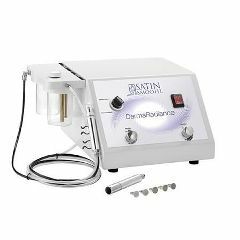 DermaRadiance combines two methods of dermabrasion: Crystals and Crystal-Free methods are available in one compact size to maximize your services and to offer customized treatments for your clients. DermaRadiance is superior because of the substantial difference in our suction technology. The very noticeable appearance of vital skin in people who have received DermaRadiance treatments is testimony to the multi-faceted benefits of our two methods. With the ease of flipping a switch, the dual-control feature allows for both Diamond Crystal and Crystal-Free Organic Grains treatments, so that skin conditions can be revitalized.